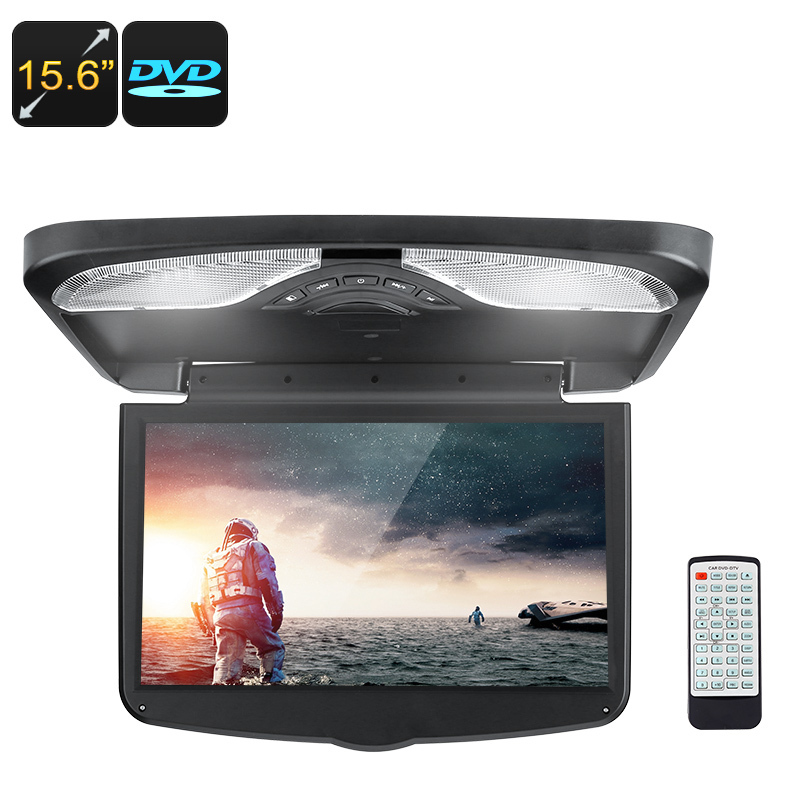 Successfully Added 15.6-Inch Roof Monitor - 1366x768p, AV, USB, SD, Region Free DVD, FM Transmitter, Built-In Speaker, 32 Bit Game Support to your Shopping Cart. Keep your passengers entertained with this 15.6-Inch roof monitor. This car DVD player is the ultimate car gadget to keep your children or passengers busy throughout your upcoming road trips. From now on, not a single moment of boredom will be experienced in your vehicle again. This car media player allows you to watch DVDs at all time. It comes with a region-free DVD player meaning that it is capable of playing all your discs. No matter where you’ve purchased your latest DVD, this car flip-down monitor is guaranteed to play them all. Additionally, this car accessory supports AV, USB, and SD inputs. Thanks to this, it offers you plenty of possibilities to insert your favorite media through different sources. On its large 15.6-inch HD display, all films can be enjoyed in stunning 1366x768p resolution. The screen itself has a 90-degree rotating design. Thanks to this, your passengers will always be able to enjoy the perfect viewing angle no matter where they are seated. Your car DVD player furthermore lets you manually adjust the colors and brightness. With this feature at hand, you can be assured that you’ll always be treated with sharp and vivid images. Supporting a 16:9 screen ratio, this roof monitor lets you enjoy the latest wide-screen movies in their fullest glory. This flip down monitor for in your car has a built-in 2W Dual-Stereo speaker. Thanks to this, you’ll always be able to enjoy great audio while watching your films or series. Additionally, it supports an FM transmitter. This allows you to play your audio straight through your car’s speakers in order to give your audio-visual experience an extra boost. Your car accessory has its own remote control which lets you easily browse through its settings and features. From now on, your passengers will be able to enjoy a truly cinematic experience. This will make them completely forget about time while waiting to reach their upcoming destinations. Arabic: - مشغل دي في دي السيارة - Chinese Simplified: - 车载 DVD 播放器 - Czech: - Auto DVD přehrávač - Danish: - Bil DVD-afspiller - Dutch: - Auto DVD-speler - French: - Lecteur DVD de voiture - German: - Auto-DVD-Player - Hebrew: - נגן DVD לרכב - Hindi: - कार डीवीडी प्लेयर - Italian: - DVD per auto - Japanese: - 車の DVD プレイヤー - Korean: - 자동차 DVD 플레이어 - Malay: - Pemain DVD Kereta - Norwegian Bokmål: - Bil DVD-spiller - Romanian: - Masina DVD Player - Russian: - Автомобильный DVD-плеер - Spanish: - Coche reproductor de DVD - Thai: - เครื่องเล่นดีวี - Turkish: - Araba DVD oynatıcı - Vietnamese: - Xe máy DVD.